Growing your own herbs can indeed save you money. You will have the opportunity to control which herbs you grow and can literally plant as much as you want. If you are new to gardening all you have to do is buy a planter, soil, and seeds, and you can watch your herbs grow right on your windowsill. Or for those who are more advanced go ahead a plant some herbs right in your garden. 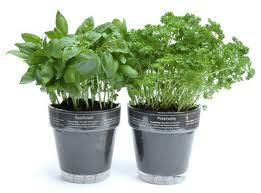 Not only will planting herbs yourself save money and flavor your food, the aromatics will also help freshen your home. And if you get really into it you can start to look up how different herbs can help when you are sick (herbal remedies). So have fun, experiment, and remember every time you plant something green you are helping our environment. Happy planting. Don’t forget to check back soon, I will be posting the electric bill slashing tips! Confesses to having an AeroGarden, which not only does a great job on herbs, but can handle smaller veggies as well. In the summer it goes out on the deck and doesn't use the lighting. In the winter, it's handy as heck right on the counter for getting just want I need to spice up my bachelor food ... lol. Just bought myself a small herb set to start gowing my own herbs - it cost me $9.99 and it cost me over $10.00 to buy each herb I needed for cooking this weekend - plan on saving a lot of money growing my own. Great idea!